The flood threat to Southeast Missouri had been downgraded a bit, but it looks like we’ll still be getting two or three feet of water on our property in Dutchtown. That’s quite a bit less than we got in 1993 and 2011. 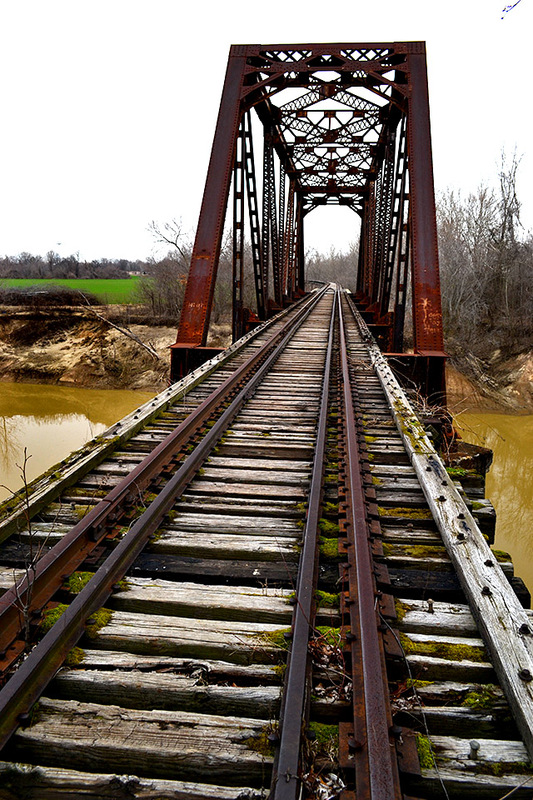 I’m not sure how high it has to get to cut off Allenville, but when it gets really high, the old Allenville railroad bridge owned by the Jackson, Gordonville and Delta Railroad Company (JGDR) is the only access to the town. 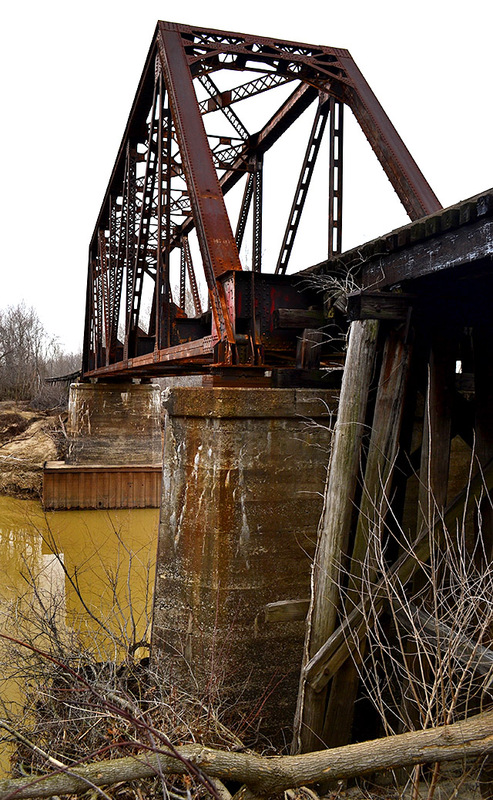 The JGDR, which once was the St. Louis and Iron Mountain Railway, has petitioned the Department of Transportation to abandon 13.3 miles of rail line between Delta and Gordonville. Having seen the condition of the rails and bridges like the one over Williams Creek, I have to agree that it would be impossible to run a train over most of that section without practically rebuilding the road bed.. Here is a link to the formal petition. If I read it correctly, if nobody objects to it by June 1, 2013, then it’ll be a done deal. 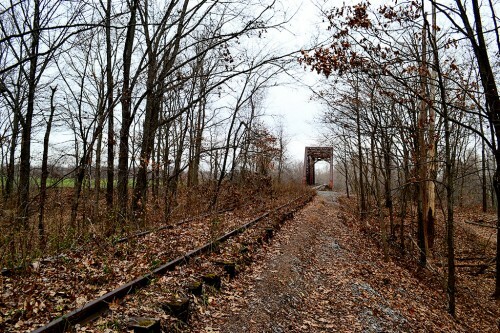 If the railway is to be abandoned and salvaged, I’d like to see the right of way held in trust for possible use for a rails-to-trails sometime in the future. Once it’s gone, it’s gone. I walked about halfway across the bridge without feeling too uncomfortable. Some of the ties on the south end show charring where someone started a fire under the bridge. I took this November 6, 2010. Click on any photo to make it larger, then click on the side to move through the gallery. Rails to Trails make great spots for geocaching trails. Why are there two sets of rails on the bridge? 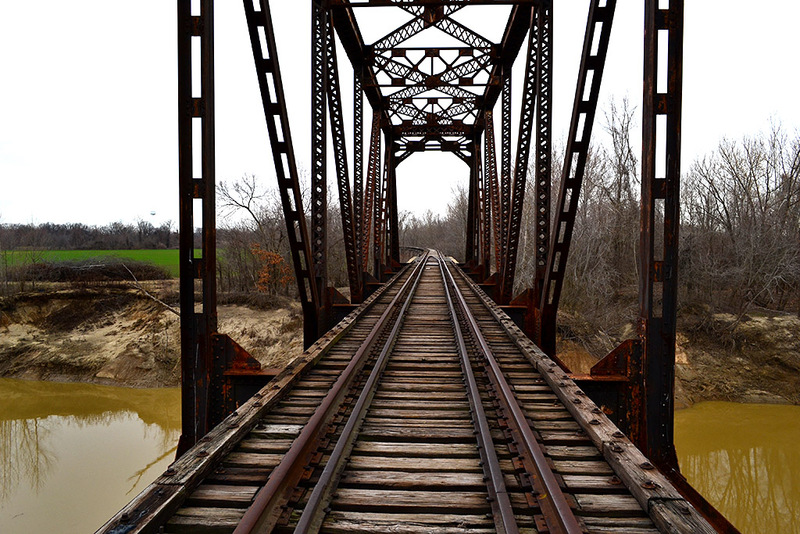 Why are there two sets of rails on the bridge?…That is such an easy question, I will let Keith Robinson answer it! Keith must be asleep at the throttle. He normally checks in right away. I’m going to give a non-scientific guess: I think the second set of rails is to insure that the load-bearing rails don’t spread. 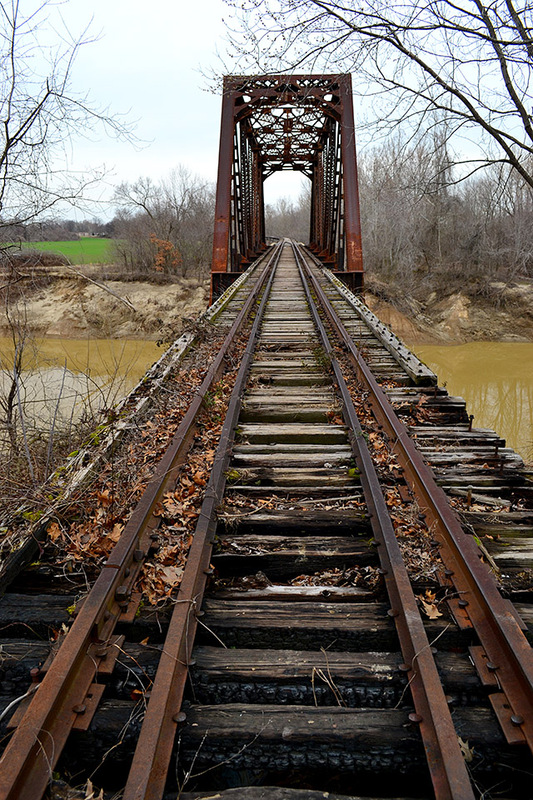 The last place in the world you would want a derailment would be on a bridge. If you pile up a train on the land, it’s not that big a deal to pick up the pieces and rebuild the track in a matter of hours. Taking out a bridge would be a Big Deal. 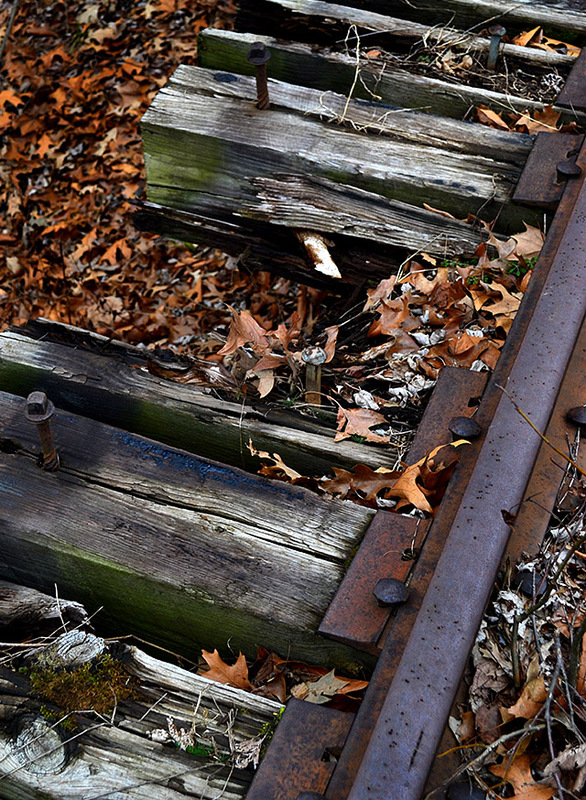 Sleepers/ties are defined as rectangular supports placed under and perpendicular to the rails. 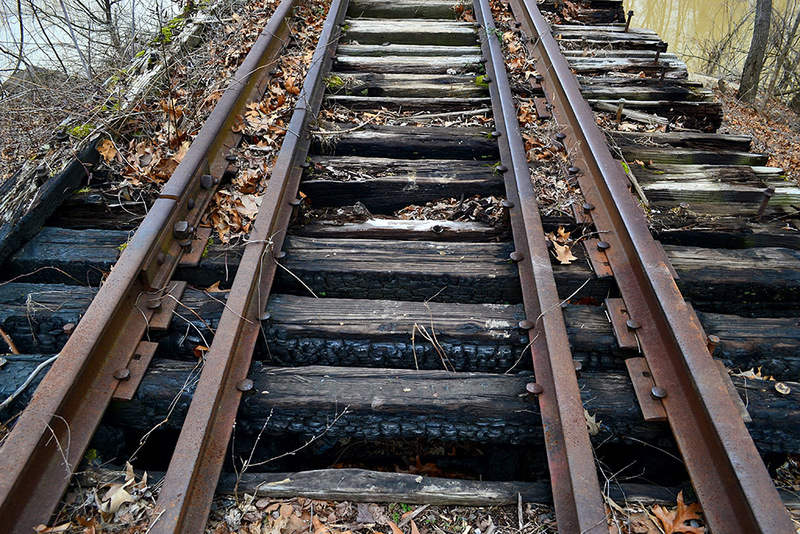 sleepers function to transfer the weight of the train to the rockbed below and also to hold the rails in place and at the correct gauge. I was away from my computer for more than 48 hours do to the NASCAR races being in KC for the weekend. 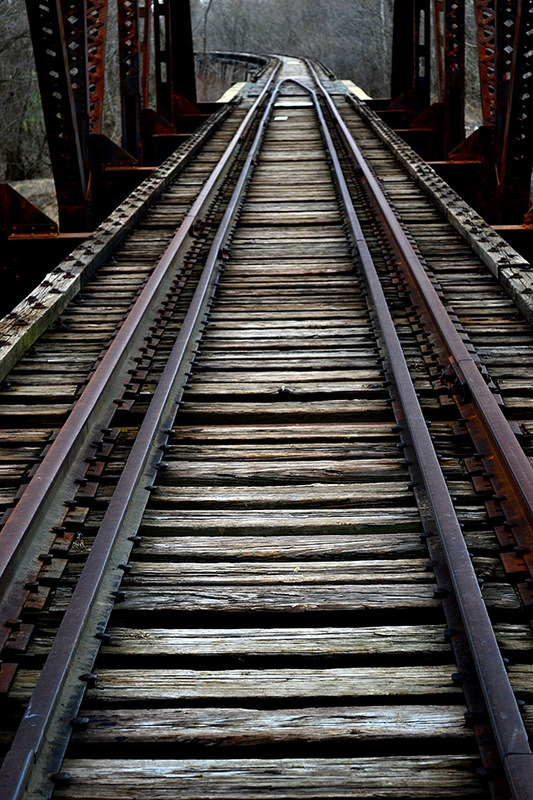 The extra set of rails are known as Guard Rails. 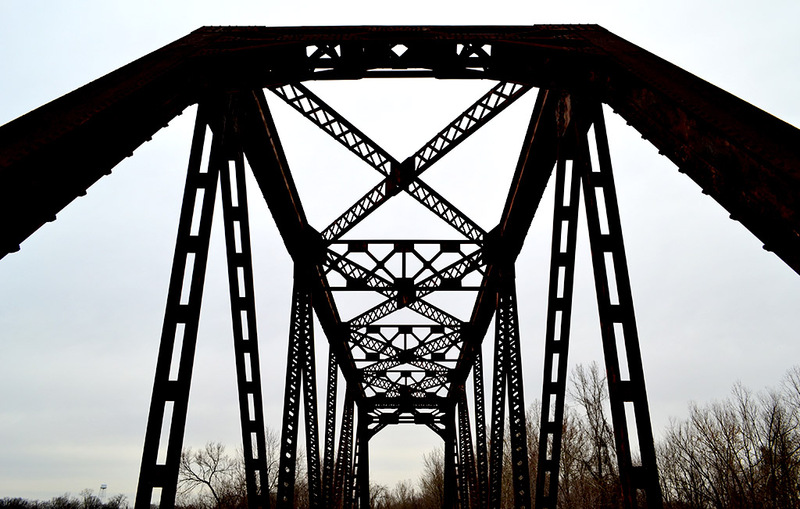 Their intent was to help keep a locomotive or car over the rails and away from the bridge structure in case of derailment. I’m sorry, this is going to be marked as an unexcused absence. The Stoddard County Historical Society trip over the old Bloomfield Road went by Allentown last Saturday, but nobody mentioned a bridge! I had no idea! Stick with me, kid, you’ll learn all kinds of things. I have more railroad stories coming. Sounds reasonable to me, Ken. What does Keith offer? Sorry I was away. The technical answer is above. Pardon the typo (do instead of due). Sometimes, despite Inez Smith’s best efforts to school me, I don’t always catch my errors. Oh, another tidbit. The boards (Guard Timbers) that run parallel to the field side (outside) of the rails and are bolted to the crossties are what keep the crossties in alignment and also assist the guard rails. 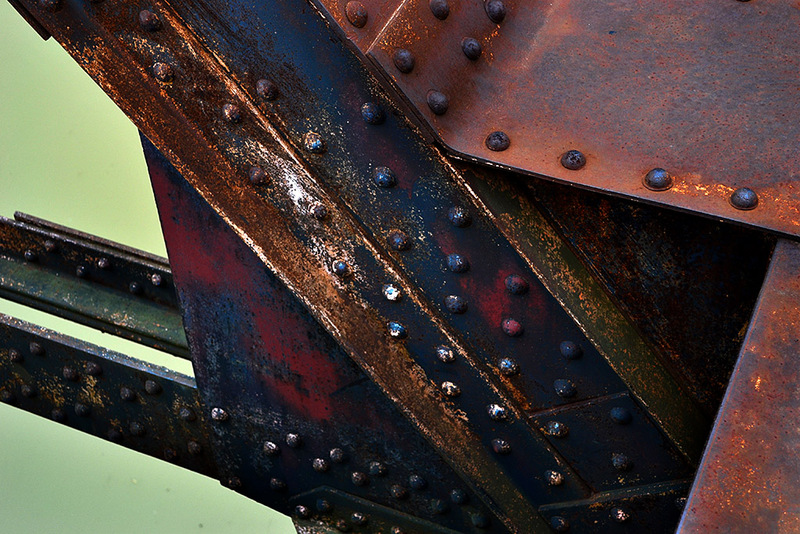 The middle two rails are to keep a train that derails on the bridge from impacting and damaging the bridge. That was my guess. Thanks for confirming it. That is a beautiful bridge over a beautiful stretch of water. Water crossings attract people to trails. I think you have a great opportunity. All you need is a group willing to set up a simple non profit (no liability) to accept the bridge and right of way. Eventually the county and city will see the economic value and take over the financial responsibility. The Peninsula Trails Coalition in WA State started with nothing in the late 1980’s, and now has a regionally/nationally known rail trail (Olympic Discovery Trail). Claire helped start the Coalition. Railroad Bridge Park, surrounding a bridge much like this one, is a magnet for tourists from all over (Tucson friends even) particularly Seattle. Bed and breakfasts have sprung up along the trail; it’s a destination now. You have a great opportunity! 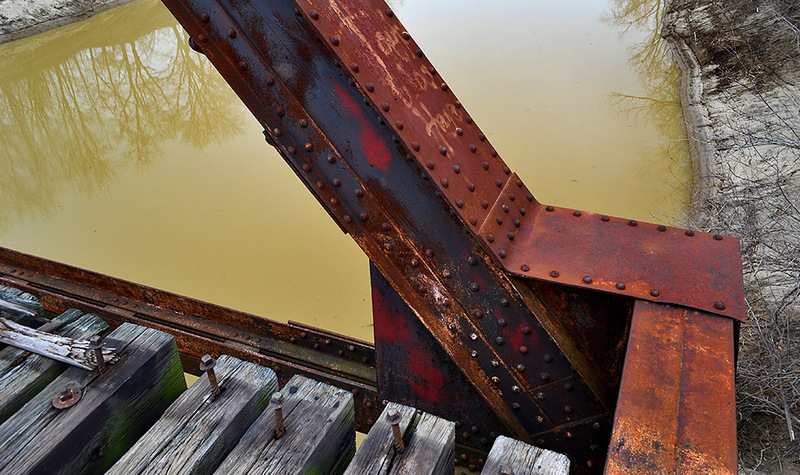 Get an organization and get the right of way and the bridge and the rest will follow. That sounds like a perfect project for experienced folks like you and Claire. I’m sure Mother would give you space in her driveway for your RV. Or, you’re welcome to set up in Dutchtown when it’s not under water. 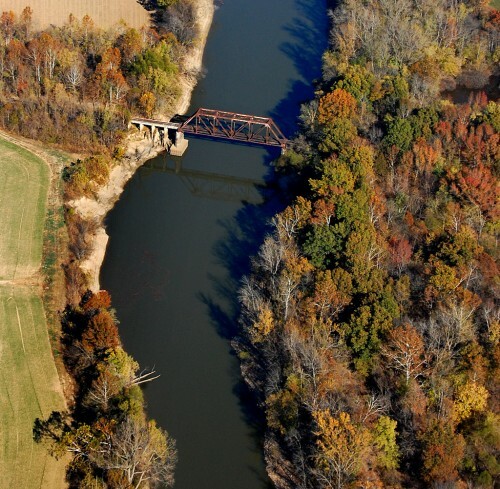 The bridge may be an historic design. It looks pretty old. The bridge is Sequim, WA is part wood (naturally in the center of logging in the last century), but this one looks pretty old. Keith Robinson, one of my readers who is a rail buff, said it was built in 1918. Previous PostPrevious Plaid Shirt School Uniforms?